A tea infuser bottle is a specialized bottle that can be used to brew tea in. An infuser unit is included inside the bottle which can be loaded up with loose tea, fruit, or a combination of both. The alternative method for brewing tea would involve the use of a pot and a strainer, making the whole matter far more complex. By using a tea infuser bottle, the whole brewing process becomes portable. Additionally, tea infuser bottles are often insulated, and so the drink you brew can be kept warm (or cold) for an extended period of time. This allows you to start the process at home, travel to work, and enjoy your drink when you get there. In this guide, we will look at five of the best tea infuser bottles available today. 7.3 What’s the Correct Way to Use an Infuser? 7.4 What’s the Difference Between a Strainer, a Filter, and an Infuser? 7.5 Can you use a Tea Bag in an Infuser? 7.6 Is a Cup Necessary? The main thing that matters when choosing a tea infuser bottle is finding one that can make the drinks you want. Also, you want one that makes them in such a way that they taste just how you want them. The Origin infuser bottle is made of thick, single-wall borosilicate glass which is BPA, BPS, PVC, and lead-free. Pyrex items are made from borosilicate glass – although this is not a Pyrex brand item, it shares similar properties, most notably that the glass is thermal shock resistant. This means that it won’t crack or break when exposed to extreme temperatures. As it is made from glass, the flavor of the drinks it produces is unaltered by chemicals leaching from plastic, or from contaminants like rust from metal. The infuser bottle comes with a neoprene sleeve which helps protect it from knocks and bumps, although you must remember this is a glass product and should be treated with care. The brewing process is made possible by a 2 piece detachable tea infuser and strainer. Drinks including loose-leaf tea, fruit infusions, herbal drinks, coffee, cocoa, or even just flavored water can be brewed. The strainer makes it easy to add anything to your drink, and not find solids floating around when you are ready to consume it. The stain-resistant bottle is dishwasher safe, reusable, and recyclable. Leak proof bamboo lid should be washed by hand, and contains food-grade silicone O-rings. A thoroughly useful and stylish way to make your favorite drinks, even while on the go. 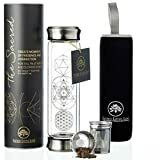 The Sacred Glass tea tumbler is a double walled borosilicate glass tea tumbler, with a removable two part strainer and infuser basket. The two part combination allows for brewing loose leaf tea, fruit infusions, cold or hot coffee, cocoa, and more besides. The outside of the glass is etched with a sacred geometry design, while the double wall design acts as an insulator – warm drinks stay warm, and cool drinks stay cool. Two leak proof lids allow for flexibility in brewing and serving drinks. The tea tumbler can be used either for purely brewing, or for drinking from too. The glass construction with the stainless steel infuser lends itself to pure flavors with no harmful plastic, chemical smells, or toxins. Comes complete with a travel sleeve for protection and further insulation. This is another BPA and lead-free borosilicate glass tea infuser bottle, this time with a single wall. It includes a removable two part strainer/infuser, facilitating brewing many different kinds of drinks, both hot and cold. The lid is leak proof and the bottle is thermal shock resistant, and capable of holding 17oz of liquid. This is quite a large bottle, and ideal for fitting lots of fruit in to flavor your drink. The bottle includes a neoprene sleeve for protection and insulation. 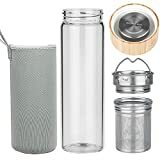 With a two piece filter and infuser unit, this borosilicate glass tea infuser bottle features a bamboo lid and is equally usable as a tumbler for drinking from. BPA-free and certified as lead-free, a silicone stopper seals the bottle to prevent your drink from touching any plastic. 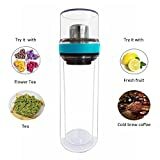 This is one of the best tea infuser bottles to make sure your drinks are free from contaminants. By adding fruit and cold water to the bottle, you’ll be able to make a tasty flavored water drink. The tea infuser is also capable of brewing loose-leaf tea or ground coffee with boiling water. With the double wall design, not only are warm drinks kept warm and cold drinks kept cold, but your hands are also protected from either temperature extreme by the built-in insulation. At a capacity of 15.8oz, it’s not the largest tea infuser bottle in our list, but it is one of the most stylish. In complete contrast to every other tea infuser bottle on our list, this double wall bottle is made of plastic, but is 100% BPA free. This makes the bottle unlikely to smash if dropped, and therefore safer for use by children. The double wall design keeps drinks at the temperature they should be, and works as insulation to protect your hands from burning. The infuser/strainer is used in a different way to others on the list. The process for making a drink involves removing the lid and putting the solids you wish to use in it, be they tea leaves, coffee grounds, or anything else. The strainer is then put in place. Once the bottle is filled with water, the lid is tightly attached, and the bottle is either inverted or shaken to allow the water to mix with the solids. After the appropriate brewing time, the bottle can be returned to the correct orientation, the lid can be removed, and the drink consumed. This design allows for the use of tea bags as well as the usual expected ingredients, and also prevents the solids being in contact with the liquid for too long of a time – once the desired strength is reached, the water and the solids can be separated easily. The downside to this method is that if you wish to create a drink with fruit infused, and want to keep the fruit separate, the lid is quite small and won’t allow a large amount of fruit to be inserted. The fruit would be better placed in the main body of the bottle, but this prevents the strainer from being used. A tea infuser is designed to make tea. That is much is obvious. But tea infuser bottles often have more than one trick they can perform. Aside from making tea, the general design of a tea infuser lends itself to making other beverages. Fruit “teas”, which are just water infused with the flavor of fruits, are one of the most popular alternative uses. 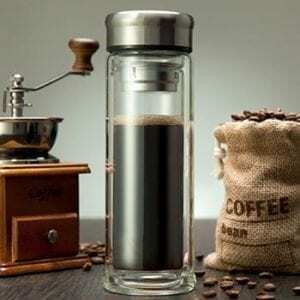 Depending on the size of the holes in the infuser unit, it may also be possible to make coffee in the bottle. Tea leaves are normally much larger than ground coffee, and so won’t easily float out through the perforations. Fine-ground coffee may be able to seep out if the holes are too large, making your drink grainy – make sure to check whether coffee-brewing is possible before making your choice, if it is a feature you are looking for. Some tea infuser bottles are insulated, like a flask, and can keep the internal temperature protected to a certain degree from the outside. This means a warm drink will stay warm, while a cool drink will stay cool. This is helpful if you don’t intend to drink your beverage straight away, as the desired temperature will be maintained for a longer period of time. It can also help to protect your hand – if the bottle is filled with very hot water, you don’t want the outside of the bottle to rapidly heat up while you are holding it. What’s the Correct Way to Use an Infuser? The infuser is to be considered a filter, keeping solids from passing in to the liquid. 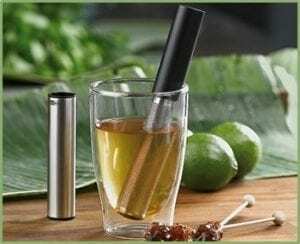 The expected use is that a solid is placed inside the infuser itself, with the water in the body of the bottle, and the flavor seeps out into the water. The lid and infuser might be removed to pour the contents into a cup, or to drink from the bottle. Some bottles may feature a mouthpiece or straw to facilitate this. The alternative way is to place the solids directly in the water, and pour the drink out through the infuser – this means the solids are prevented from leaving the bottle and the receptacle on contains liquid. Either way is perfectly valid, and depends on your preferences and the way you intend to consume your drink. Some bottles are specifically designed to be used one way or the other, some can be used in both ways, and so it is important to decide exactly how you want to use the bottle before purchase. What’s the Difference Between a Strainer, a Filter, and an Infuser? Practically, not much at all. All of these instruments separate solids from liquids. 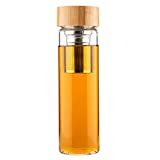 However, an infuser is normally expected to contain a solid from which the flavor should permeate into the water. A strainer will prevent solids passing from the container when it is being poured into another receptacle, and a filter works either way – it simply prevents solids from contaminating liquids. With the best tea infuser bottles, the words are sometimes used interchangeably, but if there is a specific method of drink brewing you need to use, ensure that the component parts of the bottle are designed to be used in that manner. Can you use a Tea Bag in an Infuser? Yes, you can. The simplest way is to cut off the corner of the bag and pour the contents into the infuser. This will work with black tea, green tea, fruit infusion bags, and other similar bags. Not always. Some tea infuser bottles have a removable top and bottom – the infuser sits at one end, and you can drink from the other. 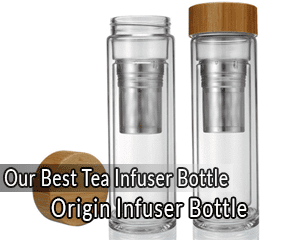 All of the best tea infuser bottles are made to similar specifications and standards, with the major variances being in the materials they are built from and the overall design. The Origin Tea Infuser bottle is the best overall choice, with strong construction, several brewing options, a stylish lid and sleeve – and it holds up to 20oz of liquid, making it the largest on our list. The plastic Topking model is smaller and will not smash in the same way as the glass bottles might in the event of an accident. If you are taking your bottle with you whilst exercising, or perhaps giving it to a child, this may be the safest option for you. What drink will you make in your tea infuser? Comment below!